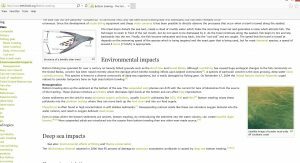 sea floor disturbance and polluted sediment redistribution. It is easy to assume that because there is a serious lack of information on a subject of considerable importance that the information could be damaging to the industry concerned. There is no serious reason to think otherwise with this present offering. Essentially our information was that bottom trawling disturbs sediments which re distributes dangerous substances which then enter the food chain and ultimately us. As you can see from the picture in the article the effect is massive. We have a paper on the ocean current stopping power of laminaria hyperborea the seaweed that is trawled on the Norwegian coast. It is easy to form a link between pollution and seaweed trawling, however there as yet is no scientific work we can find. In 2012 an area just off the Lofotens was closed for fishing certain types of fish due to dioxin and pcb poisoning – researchers were unable to come to any verifiable conclusion. Now another 2 areas have been closed Hatlebanken and sklinnnnabanken på namsdalskjysten because of dangerously high levels of pcbs and dioxins. This seems to be the story – in the 70s a ship was stopped on its way to the area to dump barrels of waste from plastic production facilities in Holland – it seems that other countries were also involved. dumping toxic waste in fishing areas. 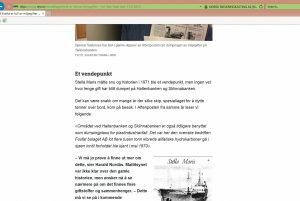 Den nederlandske tankbåt Stella Maris er nå på vei for å dumpe 600 tonn giftige klorerte alifatiske hydrokarboner på Norske fiskefelt. Det er plastindustribedriften Zoutchemie Botlek i Rotterdam som løser sitt avfallsproblem på denne måte. Enten tirsdag eller onsdag vil Stella Maris være fremme ved dumpingområdet like vest for Haltenbanken og Sklinnabanken». It says the dutch ship Stella maris is on its way to dump 600 tons of chlorinated aliphatic hydrocarbons on Norwegian fishing zones, the company concerned is zoutchemie botlek in rotterdam. Tuesday or wednesday Stella maris will be in the dumping zone west of Hatlebanken and Sklinnabanken. So we did some checking ref seaweed trawling areas and found that one area even had grids overlaid marking seaweed trawling zones. CURRENT. This raises several possibilities – none of which are good news for the seaweed trawling industry. The first is that if there are barrels or containers of these poisons in the area then dragging a 3 metre wide steel sled through the containers is going to not only open them but spread the contents far and wide, the second possibility is that the roots of the plants have captured sediments containing the poisons and by dragging the plants up the sediments are releasing the poisons into the sea. The last would of course depend on timing – however we have found that records of seaweed trawling are surprisingly difficult to find – it is easy to assume this is deliberate. – as there is massive activity in the area we can only assume that the plants are relatively free of the pollutants. This mainly refers to Sklinnebanken – however the other area Hatlebanken is too deep to trawl – so it is easy enough to assume that the area is already polluted or pollutants are being carried by currents from the trawled area and deposited there. 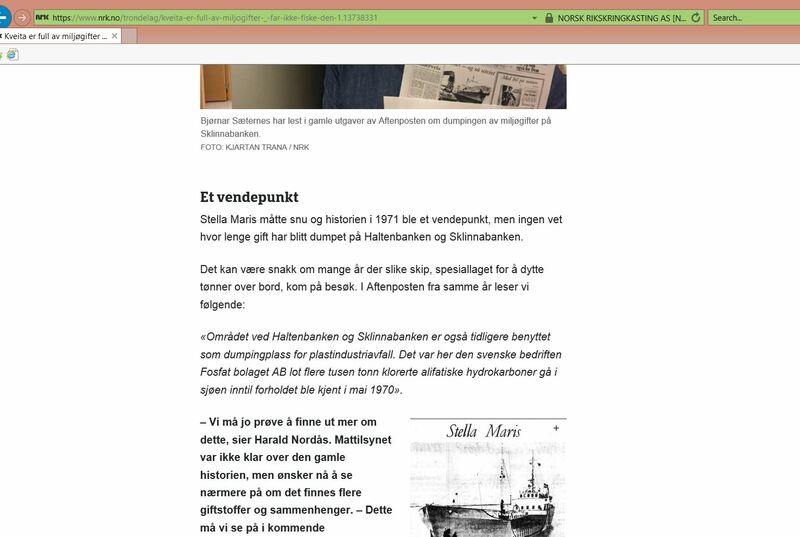 We know there must be massive redistribution of poisons from the plants being torn up from the sea floor – even worse the sediments being raked – we also are unaware of any work pertaining to this area of seaweed trawling – this is extremely poor planning on the part of the fiskeriedirektoratet and the havsforskningsinstitut. The research should have been done before any permissions were granted. Another example of the state using its power to further the interest of its “Friends”. If the area is as polluted as stated then those eating the fish are in serious danger of the most serious and deadly cancers it is possible to imagine. Just for a moment leaving the consideration of personal suffering and death – what is the financial gain from trawling the area to the state and the counties concerned, what is the cost of providing medicines and care for cancer patients? The long term financial loss to the state and the country far outweighs any current financial gain.